There was a fair degree of concern in North-East Leicestershire last year when it looked like this much-lauded pub was going to be sold off. 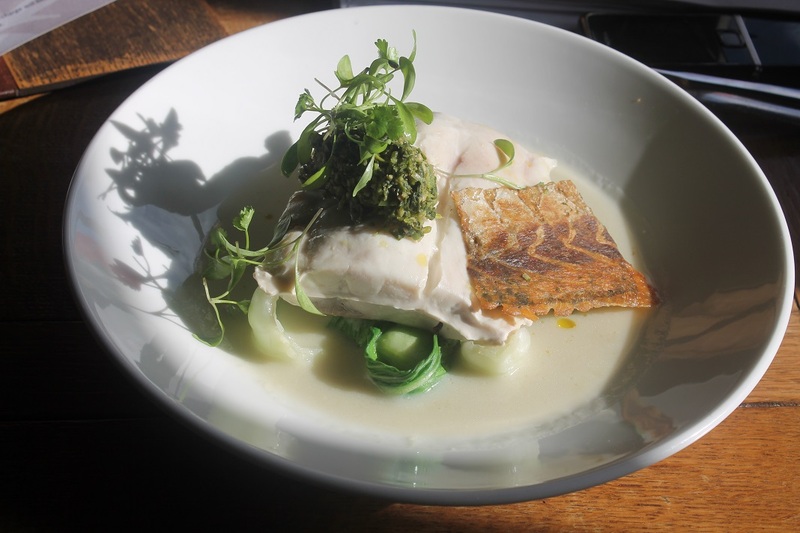 A long-term holder of Michelin’s Bib Gourmand for good food at moderate prices, it regularly featured in the smart papers as one of the nation’s top country pubs and picked up awards such as Leicestershire Dining Pub of the Year 2015 in the Good Pub Guide. The sale never quite happened. 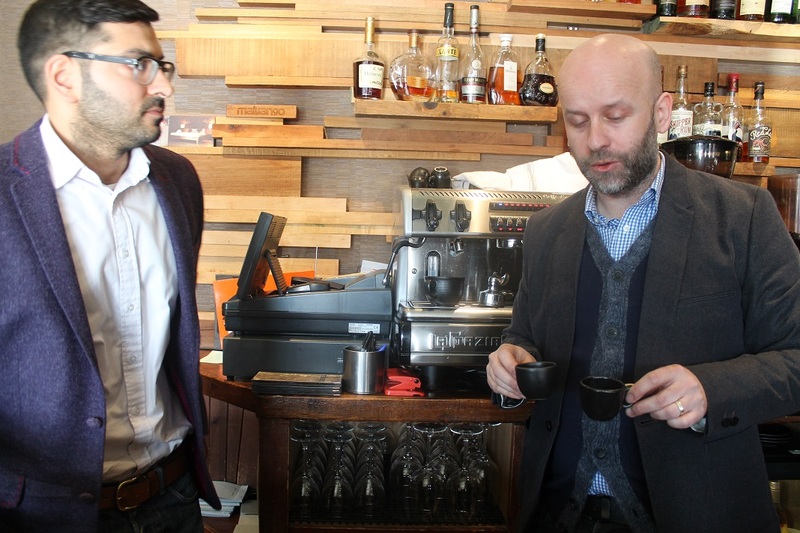 Co-owners Sean Hope and Ben Jones did however withdraw from active management to concentrate on their other venue, the equally celebrated Olive Branch in Clipsham, Rutland. 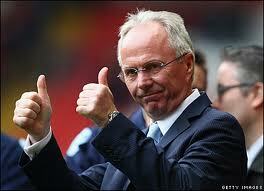 It would now be run by the returning Mark Barbour, who had been general manager from 2002 to 2006. There was a change in the kitchen too with new head chef Luke McGowan taking over. It seemed the place remains in good hands, and the Dining Pub of the Year gong was recently re-awarded for 2016. On the day of our visit, however, it was announced it had lost the Bib Gourmand (the tyre people don’t like change or uncertainty). So was there evidence of eyes being taken off the ball? No – this remains a completely delightful dining pub with excellent cooking and competent, relaxed service. It doesn’t actually look all that when you arrive. But its fairly nondescript outside hides a cosy but not twee interior of beams and yellow plaster. 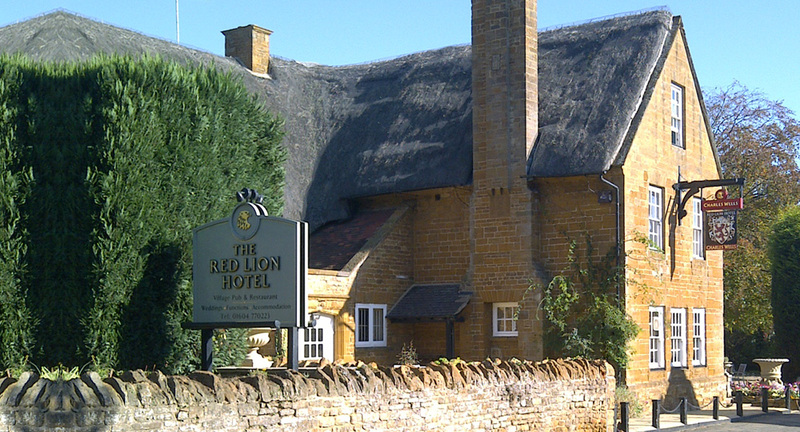 There’s a welcoming bar with good selection of draught beers – the light, golden Red Lion Ale is made for them by Grainstore in Oakham – rustic wooden tables and, in an apparent search for quirky, Leicestershire’s finest collection of colanders on the wall. The menu is printed out daily on a simple piece of paper and ranges from fish finger sandwiches through to smart though not overblown dishes such as crab and crayfish risotto or blade of beef with girolles and truffle sauce. There’s a “Dine for Less” menu with three courses for £17.50 which looks a compelling offer but this time time we went à la carte. Top marks for a little loaf of toasted pumpkin seed bread with a lovely open texture and soft crust with orange and thyme butter. Choosing a starter was a simple affair once I saw a listing for partridge with damsons and chorizo. The bird’s breast was perfectly roasted, while in effective contrast the leg had been neatly pared, crumbed and fried. With bang-on seasonality the meat was paired with sweetened, poached local damsons. I was slightly nervous about the chorizo and it was a bit too powerful – it didn’t ruin it but it just felt a bit of a Mediterranean intruder on a gentle, autumnal British plate. Goats cheese panna cotta was strongly-flavoured and, pleasingly, had a bit more texture than the smooth desert version. With its ideal partner beetroot, this time in ketchup form, and a salad with pea shoots and pak choi, it was a great lunchtime starter. We both chose fish for main courses – both were perfectly cooked with a crisp skin and yielding white flesh, but in ways which maintained the characteristics of the fish. Sea bass was soft and delicate and came with fresh egg linguini, doused in a simple veloute sauce with tiny brown shrimp, fresh peas left al dente and copious chives. The firmer, meatier hake fillet was matched with an appropriately rich gravy made with roast chicken and the dish also featured retro little balls of breaded scampi, charred leeks and superb “crispy potato” – a slice of thinly-layered potato cake cooked in butter to give a satisfying crunch. These were dishes that wear their high quality lightly – uncomplicated but well thought out, with fine ingredients and good cooking throughout. With a glass of superb Chilean sauvignon blanc from Casas del Bosque, which was on a par with celebrated New Zealand expressions of this grape, this was a fine lunch. For desert a super-rich chocolate and amaretti mousse gateaux impressed with shards of white and dark chocolate, a quenelle of light chantilly and smooth, refreshing orange sorbet. The food may be exceptional but this is a village pub and you might find live music on a Sunday, take-away fish and chips on a Friday for locals and other proper pub things. It’s good to report on a down-to-earth Leicestershire classic on good form. I was invited last week to provide a bit of feedback on the new menu at Maiyango. I enjoyed the work of chef Nick Wilson but it seems personal matters have drawn him away to Cambridge and now in charge behind the stove is Salvatore (Sav) Tassari. Recruited with Nick Wilson’s involvement as a possible successor, Sav has recently come to Leicester after four years cooking out in Tenerife but also has experience at a fine dining hotel in Chester and out in Italy. Before tasting though I was lucky enough to get a further insight into restaurant operations by sitting in on a session with Andy Hall from St Martin’s Coffee who has been charged with coming up with a new blend for Maiyango to grind. It’s great to see quality independent businesses co-operating like this. Andy had high hopes for a El Salvador Salmon Bourbon bean but while it was a complex bean the roast – done back in Central America – had not done it any favours, leaving it lacking body. More promising was a blend from Brazil and Ethiopia. 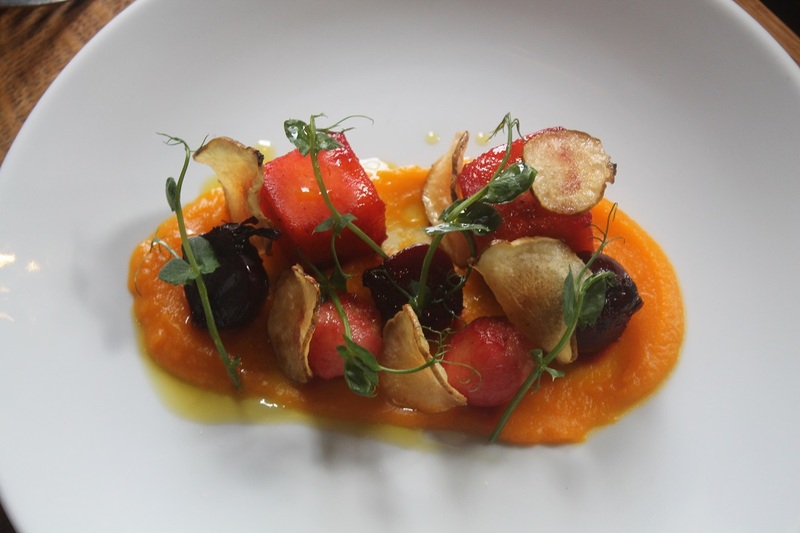 On to lunch and I was able to sample some of Sav’s dishes – including a seemingly simple but stunning starter of fragrant winter vegetables, including butternut squash, artichoke, beetroots. It’s billed as sweet and sour, but the slight spicing didn’t detract from the earthy essential flavour od the veg. Very impressive mains of a wonderful tender, rare beef fillet with asparagus, mushroom puree and truffle sauce showed really good balance of flavours, not easy with truffle. This impression was backed up by a taste of the steamed wild sea bass, spiced coconut laksa, bok choi, chilli and a refreshing mint relish which gave the whole lift. 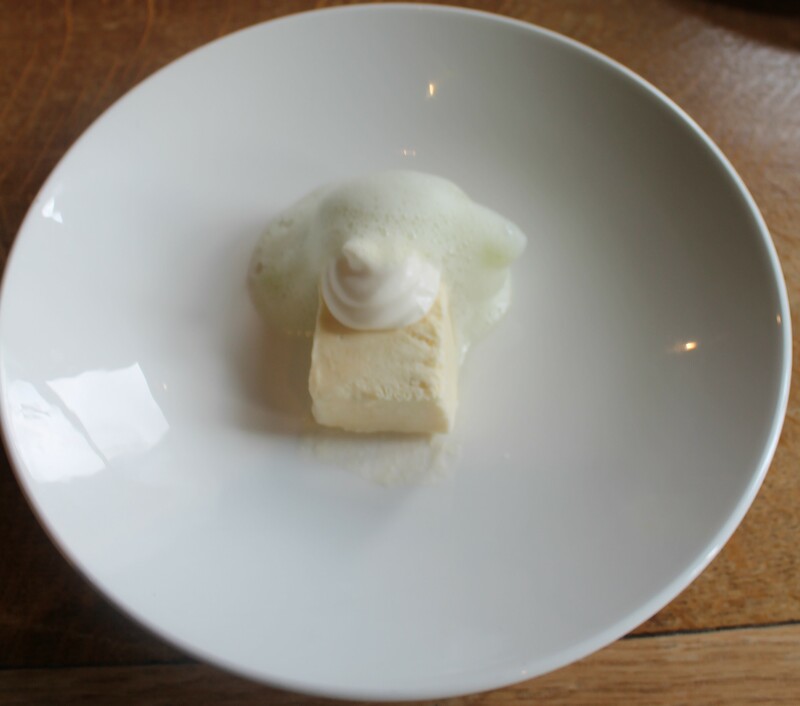 A desert of a pineapple parfait with yoghurt foam and a foaming cucumber soup was a clever combination – the cucumber was a bit insubstantial on its own but with the pineapple it all made perfect sense. All in all it seems Sav has understood his brief here and is producing interesting food that continues the house style fine dining with international influences but strong local roots too. There’s plenty of invention and plenty for vegetarians and vegans too. One more bit of news, former general manager Mark Barbour has returned to the Red Lion, Stathern, after a gap of nine years. The pub holds a Michelin Bib Gourmand and is the Good Pub Guide’s Leicestershire Dining Pub of the Year for 2015, but owners Sean Hope and Ben Jones recently announced that they are withdrawing from active management to focus on their other venue, the wonderful Olive Branch in Clipsham. Mark ran the pub fron 2002 to 2006 and since then has been training manager for the Bistro Pierre chain, opening its flagship Ilkley hotel, and general manager at the award-winning Fleece Inn at Addingham, West Yorkshire. Wailing and gnashing of teeth from the people of the Belvoir village of Stathern today with the news that the Red Lion has been put on the market. It’s a hugely successful pub, laden with accolades for its food and atmosphere, and recently done up too, but owners Sean Hope and Ben Jones have decided they want to focus on their other venue, the even more award-winning Olive Branch in Clipsham. It’s got to be a great opportunity for some other ambitious business to pick up the reins, and Hope and Jones say they are willing to work with the right people to keep it a high-performing food-focussed pub. Another full-on delivery day yesterday, this time over in Rutland, Northants and Cambridgeshire. I wasn’t going to get caught out like yesterday , and called a halt around 5.30 once I’d arrived at The Red Lion in East Haddon, near Northampton. It’s a smart but by no means intimidatingly posh gastropub. Co-proprietor Adam Gray recently returned to his roots having worked with the likes of Raymond Blanc and most recently as head chef at [Gary] Rhodes 24 in London. The pedigree shows – there’s nothing fancypants here rather a focus on doing simple things well. My belly of pork was beautifully done – fat rendered, meat tender and very flavoursome, crackling extremely noisy. Even the mash was noteworthy, while the gravy was winey and so damned tasty I sneaked a glug from the little jug when no-one was watching. An apple tart – heavily touted by my waitress was a bit ordinary – pureed fruit, no great depth of flavour – though the clotted cream ice-cream that came with it was fantastic. Looking at the rest of the menu it seems admirably unfussy – pumpkin soup with oxford blue cheese fritter, slow-cooked lamb with turnip gratin and buttered leeks – and I’m not surprised the Michelin crew have already given it a Bib Gourmand. There’s a small but smartly kitted out cookery school attached too. Might be worth a drive for those in the South of Leicestershire and it’s certainly worth considering a small diversion if you’re travelling home on the M1 or A5 – as the crow flies it’s about two miles from Watford Gap services. I know where I’d rather go.